Hey, I have two questions. Why do we have resistors in intrinsic safety barriers? And what's the difference between a safety barrier and a galvanic isolator?. Although we have two questions here, the answers relate to each other. To start with, we need to talk about the working principle of intrinsic safety barriers and galvanic isolators. I can’t see another way of explaining without coming back to the basics. Also known as a Zener barrier, the intrinsic safety barrier limits voltage and current in the field, reducing the risk of the process releasing enough energy to ignite gases present. This barrier has three main components – the Zener diode, the resistor, and the fuse. The diode limits the voltage of the circuit, the resistor limits the current in the field, and the fuse protects the whole system. However, an intrinsic safety barrier must have one more external component – a safe ground. If you don’t have a safe ground, then you can’t use a Zener barrier. When the input voltage increases above the Zener diode’s capacity, the diode drains (conducts) it to the safe ground. Then the fuse blows to protect the system. Also, you should have at least two diodes. If one fails, then the other will protect the system. Finally, the intrinsic safety barrier, as a passive device, doesn’t need an external power supply. It can create voltage drops, so you should include that factor in your energy calculation for the field device. In summary, the resistor limits the current of the circuit, the Zener diode limits the voltage, and the fuse protects all the components. 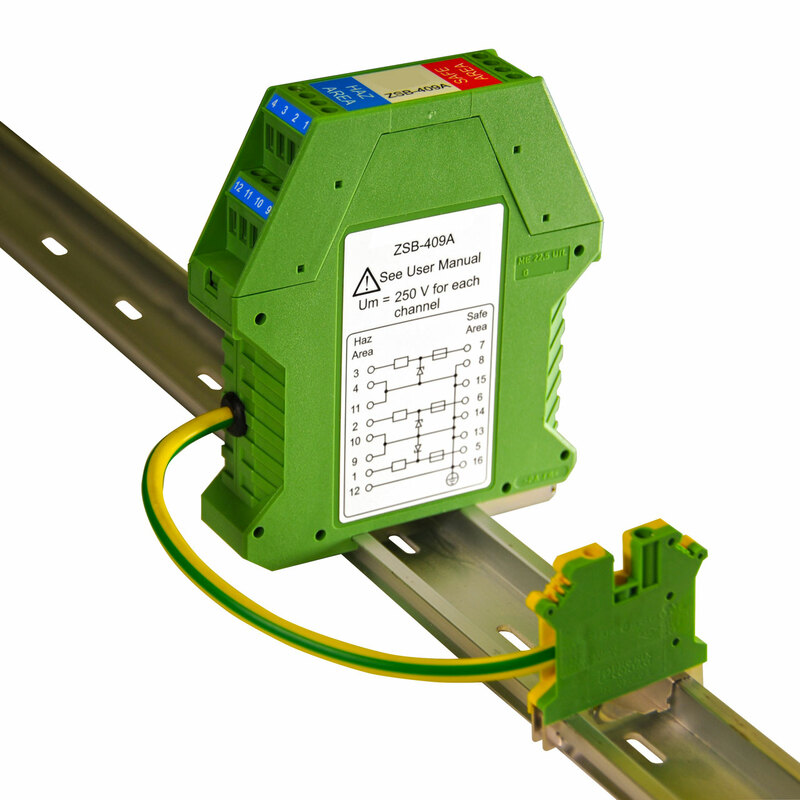 A galvanic isolator also limits energy in the circuit, but it doesn’t need a safe ground. It also qualifies as an active device, meaning you need an external power supply. A galvanic isolator stands between the control system and the field device, insulating each from the other. The two sides can transfer data in several ways, such as induction or capacitance. Usually, a galvanic isolator costs more than a Zener barrier, takes up more room, and needs an external power supply. However, it isolates the field device from the system. It doesn’t depend on a dedicated ground, and you can convert passive current to active current signal in most barriers using loop matching.